There are many board games available that kids can choose to play with their friends. There are classic board games that has stood the test of time that both kids and adults still find enjoyable. But there are times when they tend to get boring if they play the same board game all the time. Having another option like the Tsuro Board Game can help keep the fun going. The Tsuro Board Game is a tile-based game ideal for two to eight players. The main objective of the game is to compete with other players to determine the last playing piece still standing on the board. The first part of the game involves players choosing a playing piece and then placing it on any of the board edges that indicates a path. Players then start by taking three path cards from the pile. The first player then places a path card onto his or her playing piece starting point to create a path and move the piece inside the board. The player then takes another card from the main pile to replace the one used. Then the next players do the same. In order to stay inside the board, players need to play their path cards in a way that will let them stay inside the board as they create a path. It is also possible that they can place a card in such a way that will lead other players on a path outside of the board, which can eliminate them. Play ends when all the cards are used on the board and the player that remains standing becomes the winner. 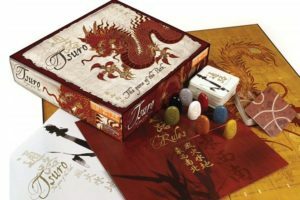 The Tsuro Board Game takes around an average 15-minute playing time, just enough for a fun round without becoming boring. It also helps players develop their skills in devising strategies for winning in the game. This board game is ideal for kids from 8 years old and above. Tsuro is available on Amazon for $22.